WARRIOR AMY: All those boys chasing me, but it was only ever Rory. Why was that? For Hallowe'en, here are some talks to enjoy. Here's David McNally, talking about the ideas in his book Monsters of the Market: Zombies, Vampires and Global Capitalism, which I mentioned (and cribbed from shamelessly) in this recent post. Here's Silvia Federici, talking about her book Caliban and the Witch, which links the witchhunt craze to the rise of capitalism. 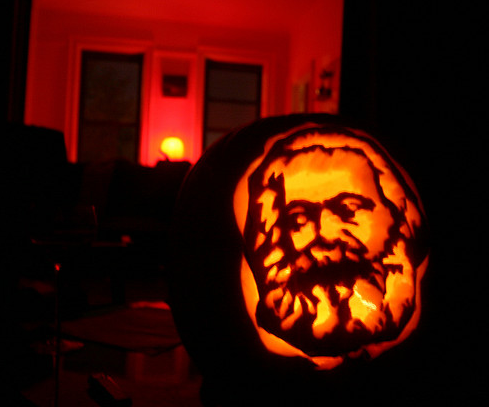 And here's China Mieville, giving a Marxist view of Hallowe'en (which is more fun than it sounds). Monsters of the world, unite! This is a slightly-tweaked version of something originally published in the January 2011 edition of Panic Moon. Back issues of this excellent fanzine (now, sadly, on hiatus) are still available, here. Plant monsters. That’s an old one. Where does it come from? Maybe it’s about the Venus Fly Trap, the cactus or the thorns on the stem of a rose. Maybe it’s about the faces that we see in the gnarled bark of trees; the faces that gave us generations of tales about tree folk. We see this in 'The Seeds of Doom', in the initial humanoid shape of the monster, in its booming threats, in its communion with Chase, in the way that the Doctor keeps calling it Keeler ironically, having chided Sarah for referring to the transformed Winlett by name. The spread of the tentacle – a limb-type with no Gothic or traditional precedents (in ‘Western’ aesthetics) – from a situation of near total absence in Euro-American teratoculture up to the nineteenth century, to one of being the default monstrous appendage of today, signals the epochal shift to a Weird culture. Miéville charts the way that the cephalopodic suddenly erupts into late 19th-early 20th century "teratology" (monsterology), with conflicted foreshadowings and pre-disavowals (Verne, for example, and Victor Hugo) leading up to a story called 'The Sea Raiders' by H. G. Wells, in which previously unknown squidular monsters suddenly surface and go on an inexplicable rampage off the British coast, and on to the "haute Weird" of William Hope Hodgson and, especially, H. P. Lovecraft. I was watching The Bride of Frankenstein yesterday; appreciating the fact that James Whale invented the self-analysing comic horror film decades before Wes Craven thought it would be tremendously cute to have characters in a slasher film talk about the narrative rules of slasher films. At one point, the insane, camp, gin-swigging Dr Pretorius (played by the ridiculously watchable Ernest Thesiger) shows Frankenstein (Colin Clive) his collection of creations: tiny people that Pretorius grew from cultures and... well, it's pretty much indescribable. Watch it for yourself. If you've never seen it, you need to. It isn't explicitly said, but clearly both Pretorius and Frankenstein anticipate (the former with relish and the latter with fear) the breeding of a new race. Pretorius, for all his campness and his disdain for every human female he meets, seems interested in the breeding potential of these creations of science.